Contemporary K-pop is driven by image as well as music. Part of this has to do with its emergence along with rising technologies like the music video and the Internet, which “generate[d] a condition of possibility of reaching a mass audience outside of national borders,” and resulted in photogenic performers as part of appealing images (Lie, 353, 356). This is similar to rhythm and blues-inflected pop music of the 1960s. Gerald Early notes that technology contributed to this music becoming an “artifact,” in part because television distributed the music as well as an image (60, 62). K-pop agencies, like SM Entertainment, carefully craft the images of K-pop artists for concepts. This is part of the training process, which also includes language instruction, choreography and hosting practice. This also contributes to criticisms that such preening in the quest for audience acceptance diminishes the presence of ethnic culture. John Lie argues that contemporary K-pop lacks Korean culture: “As a matter of traditional culture, there is almost nothing ‘Korean’ about K-pop” (360). Motown acts under Berry Gordy also received similar kinds of training and, were subject to similar criticisms. Nelson George defines Gordy’s project as assimilationist in nature, where “white values were held up as primary role models” and as a result, “blacks lost contact with the uniqueness of their people, and with their own heritage” (xii). For George and Lie, mainstream appeal translates into a loss of ethnic culture. When K-pop adopts the 1960s retro look for female artists through chic hairstyles and dresses with eye-catching prints or dazzling sequins and fur reminiscent of The Supremes, I suggest that it partakes of a model of ethnic glamour established by black girl groups. Brian Ward characterizes Gordy’s quest for mainstream success as one predicated on challenging prevailing notions about American blacks: “Gordy felt [the training] might make them more acceptable to white America and an expanding black middle class for whom mainstream notions of respectability remained important” (266). The aspiration was felt by blacks, even those not in the middle class: “The spangled pursuit of success carried no stigma among black fans who had routinely been denied equal opportunity to compete for the financial rewards of the mainstream” (Ward, 267). This is key, because it shows the importance of how viewers read such images. Cynthia Cyrus argues that even though the images of girl groups of the 1960s were well-managed and carefully crafted, they nevertheless resonated positively with fans: “The girl group images offer affirmative messages about what it means to be female, messages about belonging, about possibilities for participation, about the possibility of success. . . . The role of the viewer is central to creating meaning, and the girl group fan engaged actively in dialogue with the images placed before here” (190-1). Just as black fans interpreted those images of black women as positive, Korean women like the Kim Sisters, styled in the same way, represent a glamourous ethnic, in this case, Korean, experience to aspire to. Ian Kim writes: “For a Korean American like me, who grew up in parts of the US where I was the only Asian kid in school, it’s pretty astonishing to discover Korean performers who were successful in the US such an early time. 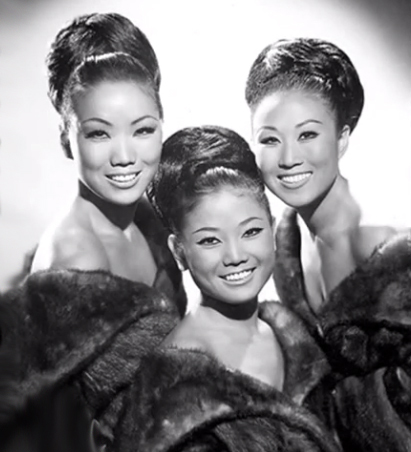 Even more impressive is that they sang in English.” The Kim Sisters’ images and participation in the entertainment world in the United States functioned as an alternative to the realities of the aftereffects of the Korean War and American military presence. San Byun-Ho remembers: “After the Korean War, the Korean situation was the worst in the world; we were one of the poorest countries, like the Congo or somewhere like that. The country was devastated. A lot of people died” (Forsyth). Just like images of 1960s black girl groups, such images of the Kim Sisters represent an image of ethnic aspiration. Contemporary fans may see retro images in K-pop, like those by Lee Hyori and the Wonder Girls, as drawing from a visual discourse of ethnic glamour. The measure of the impact of the image should also be measured by those who make meaning out of it. These images matter precisely because they show Koreans in a glamorous context that also acknowledges their ethnicity. As the Vintage Black Glamour Tumblr and forthcoming book suggest, images of ethnic glamour still resonate today. Nichelle Gainer says that any image she chooses has to have “a certain style to it, a certain beauty” and that she includes information about the photo because “I want people to know you’re not looking at some anonymous random person” (Brown). Given the frequency that the 1960s concept recurs in K-pop, ethnic glamour still matters. Brown, Tanya Ballard. “‘Vintage Black Glamour’ Exposes Little-Known Cultural History.” The Picture Show – Photo Stories from NPR. NPR . 12 Oct 2012. Web. 27 Jan 2014. Early, Gerald. One Nation Under a Grove: Motown and American Culture. Ann Arbor: University of Michigan Press, 2012. Forsyth, Luc. “Korea’s Stressed Masses.” Groove Korea. 20 Aug 2012. Web. 27 Jan 2014. Kim, Ian. “The Kim Sisters.” Ian Kim. 23 Jan 2014. Web. 28 Jan 2014. Ethnicity, Glamour and Image in Korean Popular Music by Crystal S. Anderson is licensed under a Creative Commons Attribution-NonCommercial 4.0 International License.